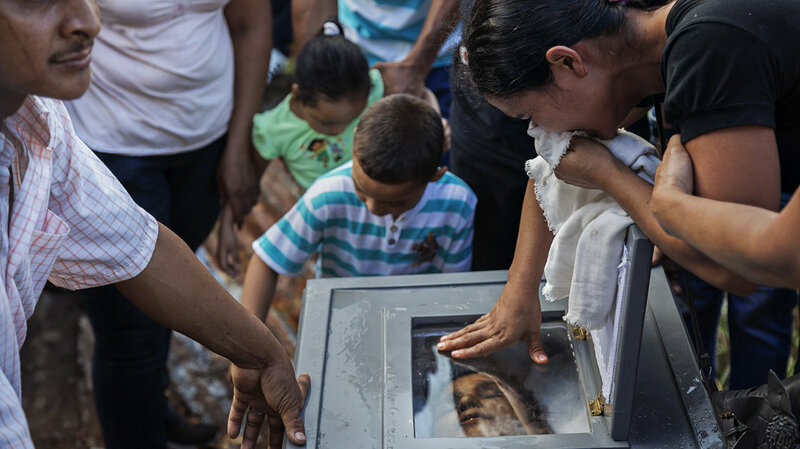 Loved ones express their grief at the burial of Ramon Romero Ramirez in Chichigalpa, Nicaragua, January 2013. The 36-year-old died of chronic kidney disease after working in the sugar cane fields for 12 years. Ramirez is part of a steady procession of deaths among cane workers. Manuel Antonio Tejarino used to be a lean, fit field hand. During the sugar cane harvest, he’d swing a machete for hours, hacking at the thick, towering stalks. Now Tejarino is slumped in a faded, cloth deck chair outside his sister’s house on the outskirts of Chichigalpa, Nicaragua. Tejarino’s kidneys are failing. He’s grown gaunt. His arms droop by his side. In the tropical midday heat, he alternates between wiping sweat off his brow and pulling a sweatshirt up over his bare chest. 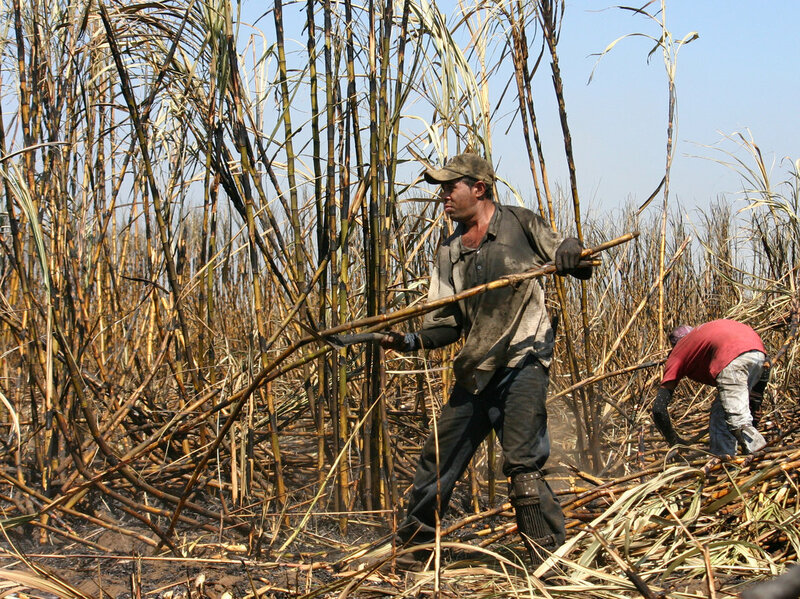 Manuel Antonio Tejarino, 49, cut sugar cane for nine years. Now his kidneys are failing, and he is too sick to work. In Central America, a form of kidney disease is attacking men in the prime of their lives. Researchers are struggling to explain what’s causing it. The condition appears to be concentrated among male agricultural workers, particularly sugar cane cutters, along the Pacific coast. The town of Chichigalpa has been hard hit. It’s surrounded by the cane fields of El Ingenio San Antonio, one of the oldest and largest sugar estates in Central America. The estate produces raw sugar that’s shipped to the U.S. and elsewhere. It also refines ethanol to make a popular rum marketed globally under the name Flor de Cana. Tejarino’s doctor says hundreds of men in Chichigalpa are suffering from this mysterious kind of chronic kidney failure. It’s not related to diabetes or other well-known kidney diseases. The first reports of this disease date back at least 20 years. At first the clusters of men dying of kidney failure was dismissed as a fluke. Then it was written off as diabetes or some other underlying health problem that hadn’t been correctly diagnosed. Despite years of research all over the world, scientists still can’t definitively pinpoint the cause. “We don’t know. That’s the unfortunate part, and we do desperately need to find some answers,” says Reina Turcios-Ruiz, a medical epidemiologist with the U.S. Centers for Disease Control and Prevention’s office in Guatemala City. This form of kidney failure, known as insuficiencia renal cronica in Spanish (or chronic kidney disease of unknown origin in English), is now found from southern Mexico to Panama, Turcios-Ruiz says. But it occurs only along the Pacific coast. The disease is killing relatively young men, sometimes while they’re still in their early 20s. Researchers at Boston University have attributed about 20,000 deaths to this form of kidney failure over the past two decades in Central America. As the disease progresses, agricultural laborers, who may earn a couple of thousand dollars a year, if they’re lucky, end up in need of dialysis that costs tens of thousands of dollars annually. Treatment options in El Salvador, Guatemala and Nicaragua for kidney problems are extremely limited, Turcios-Ruiz says. The epidemic has become a major burden on already overstretched public health systems. One of the prominent theories about the disease is that men get dehydrated as they cut sugar cane under the intense tropical sun. Then the dehydration somehow makes them more susceptible to environmental toxins. Researchers are also looking into whether an agricultural chemical might be causing the problem. A similar epidemic is afflicting sugar farmers in Sri Lanka, which has a hot, dry climate similar to western Nicaragua. In response, the Sri Lankan government banned the use of glyphosate this past March. Glyphosate is the generic version of the popular herbicide marketed by Monsanto as Roundup. Officials at the Ingenio San Antonio in Chichigalpa say they also use Roundup. But a link between the herbicide and the disease hasn’t been proven. Other theories about why these men are dying have been all over the map. For a while health officials blamed the kidney failure on a potent local moonshine, which included industrial-strength ethanol smuggled out of the sugar plant. Some people think the epidemic might be linked to hantavirus, a rare respiratory virus spread by rats. Tejarino’s doctor at the clinic in Chichigalpa thinks overuse of over-the-counter pharmaceuticals could be to blame. Tejarino dismisses this idea and goes back to the herbicide theory. “It was the chemicals, the chemicals at the plantation,” he says. More than a decade ago, the sugar company in Chichigalpa recognized that something was amiss. The company started testing the kidney function of workers before each harvest. Anyone showing signs of kidney failure, even early stage kidney disease, wasn’t allowed to work. Now the town is burdened with sick, unemployed men and widows. One community on the edge of Chichigalpa has lost so many men that it’s called La Isla de las Viudas — the Island of Widows. Company officials deny such allegations. The refinery has its own state-of-the-art hospital. The company offers free education to its workers’ children. And it feeds employees during their shifts. What about the sick laborers who can’t work? The company says it provides monthly food packets and basic medical supplies to a group of about 2,000 ailing former workers, as well as to widows in Chichigalpa. The company is as eager as everyone else to find the cause of the disease, says Alvaro Bermudez, the head of El Ingenio San Antonio. “It’s a problem in the sense that any problem that affects our community affects us.” But Bermudez says the company is not sickening its own workers. Frustration over the disease — especially what’s causing it and who’s to blame — has led to violent protests against the sugar company in Chichigalpa. Earlier this year police killed one protester and seriously wounded another near the plantation gates. She sits next to her husband, slowly running her fingers through his black hair. She says people all around them are dying. It’s been going on for years, and in her opinion, everyone’s ignoring it. “This disease doesn’t spare anyone,” she says. And researchers think it could be years before anyone solves the mystery. This entry was posted in Kidney Problems, News, Uncategorized. Bookmark the permalink.